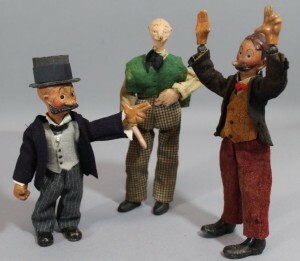 Whilst reporting on a toy auction I came across a collection of unique jointed metal dolls from the A. Bucherer and Cie Company of Amriswil, Switzerland. 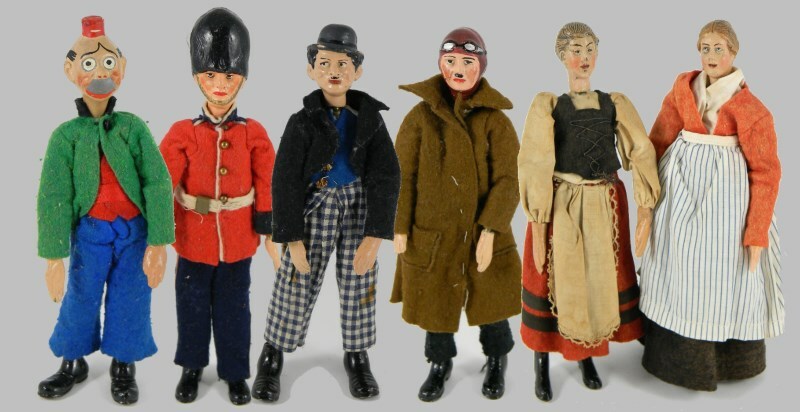 The dolls ranged from popular characters from the 1920s including Charlie Chaplin and Mutt & Jeff to farm ladies and a pilot. On checking my reference library I was only able to find one reference to A Bucherer dolls in Dawn Herlocher’s 200 Years of Dolls: Identification and Price Guide and even internet search did not reveal much more information of these inventive dolls except an excellent feature by Sherry Minton on AntiqueTrader. 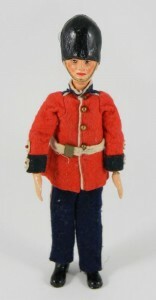 Luckily a number have made their way for sale and to the auction market enabling us examine the dolls in more detail. The A. Bucherer and Cie Company produced dolls from 1921 to 1930. Swiss innovation and invention in the early 20th Century made the country a world leader in clocks and watch technology, and music boxes among others. 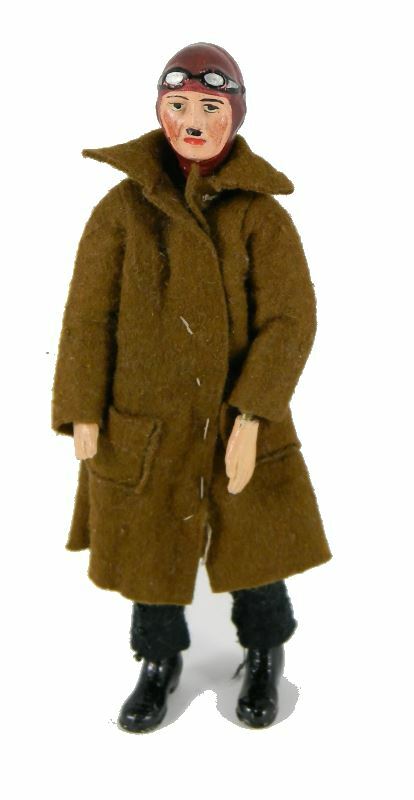 It seems that knowledge and technology moved into the creation of finely articulated dolls. The dolls had changeable heads which were made of plaster composite material as were the hands and feet. Head features such as hats were also moulded see the Bucherer Policeman and Bucherer Coldstream Guard as examples. 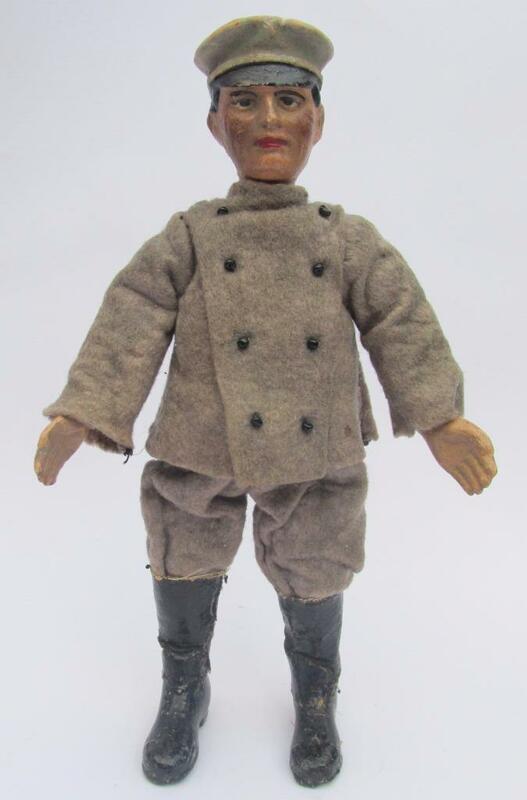 The dolls measured between 6 to 10 inches high and were marketed under the name SABA an acronym for Speilwarenfabrik (toy factory) August (first name of Burcherer) Burcherer Amriswil (location of factory). Many of the dolls were made for particular markets especially America where the celebrities and comic characters were popular, and according to records two-thirds of the dolls produced found their way to US market. 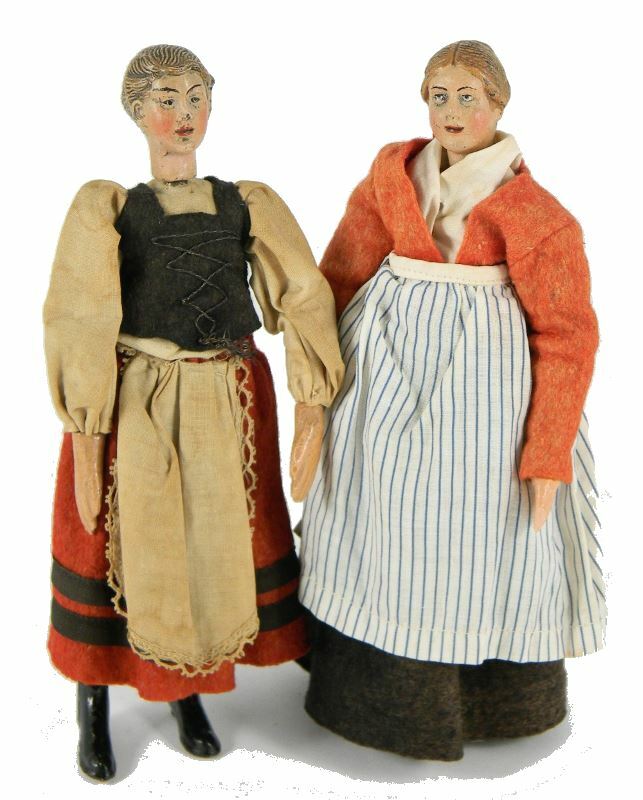 Pair of Bucherer Farm Ladies metal jointed figures, Swiss 1920s, both with moulded painted heads, hands and shoes, ball jointed articulated metal bodies, wearing felt and cotton clothing, 7 ½” (19cm) tall. Sold for £220, Nov 2016 at C & T Auctioneers.